I was watching ESPN2 this morning since I wasn't in World Cup mode, yet. Then I kept getting text messages from my friends about the soccer/futbol game/match, so I flipped the channel and started to watch the 2nd half of the Republic of South Africa v Mexico match. First thing I thought to myself was, "What's that noise?". Next thing you knew I shared a few texts with my friend and all he could do was complain about the horns. "I can't believe FIFA let those horns in again," he wrote. So - for those of you who didn't know (i.e. like me), here's the lowdown on the horns and that buzzing sound. Forget the #1 finger and leave your cow bells at home, because the vuvuzela horns appears to be the must-have accessory at the tournament in South Africa. 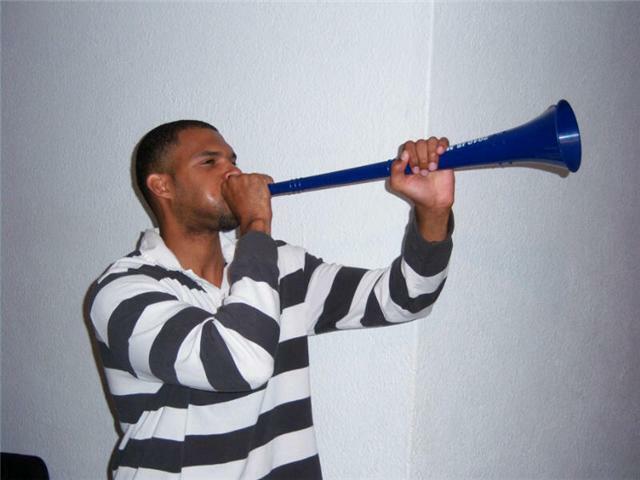 According to Wikipedia: A vuvuzela, sometimes called a "lepatata" (its Setswana name) or a stadium horn, is a blowing horn, approximately one metre in length, commonly blown by fans at football matches in South Africa. They require some lip and lung strength to blow and emit a loud monotone like a foghorn or an elephant. Further, according to the article in The Straits Times, "The din emitting from the tuneless plastic horns is louder than that from a drum or a chainsaw, according to the survey by hearing aid manufacturer Phonak. It said tests had shown the sound emitted by a vuvuzela was the equivalent to 127 decibels. The sound from a drum was put at 122 decibels while the sound from a referee's whistle registered 121.8 decibels. 'Extended exposure at just 85 decibels puts us at a risk of permanent noise-induced hearing loss,' Phonak said in a statement on the SAPA news agency." I hope that the people in the stadiums and my friend, Cordell Green (i.e. who sent me this picture and is over in South Africa right now for the 2010 World Cup), are watching the matches and wearing earplugs. It sounds lame, and maybe I'd never think to wear earplugs at a concert, but I read that people who are subjected to 100 decibels or more, can experience hearing damage in just 15 minutes! What? Can't hear me? You might not be able to go to South Africa for the 2010 World Cup, but you can certainly buy a vuvuzela, thanks to Amazon. Have fun, boys and girls!